A lovely family adopted Ginger back in 2003. 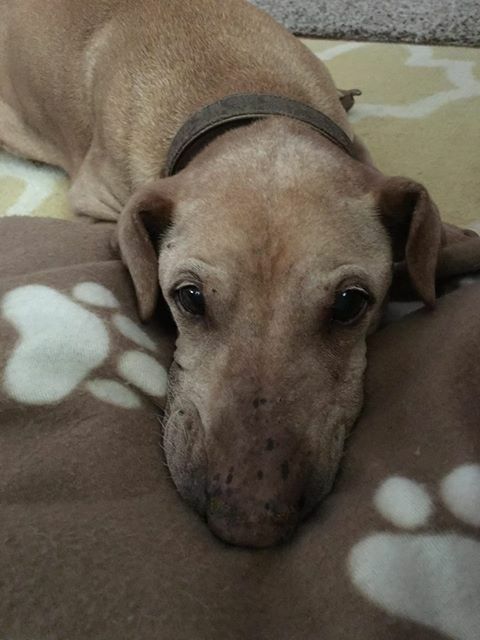 Unfortunately Ginger passed away recently, but the adopters wanted to share her life story with us. It is a wonderful Happy Tail and our hearts are full knowing Ginger was so loved for so many years! In 2003 Kayla picked Ginger out at our local SPCA to join our family & her little brother Fred (the turtle). At the time Ginger wasn’t really interested in us or any humans. Given her history of abuse, we vowed to make her feel loved & treated like a princess for the rest of her life. Ginger fiercely protected Kelly, Kayla & Charleen from any strangers (including pop pop until she bonded with him after a few months). Ginger loved to take walks, chase squirrels and eat! She never spent a night away from home or her family & most nights was curled up next to Kelly in bed. Whenever any of us were sick, Ginger stayed by your side & loved giving get well kisses. She spent many days beside Charleen battling various lupus flares. She stayed by pop pops side when he was rehabbing with us after a major surgery. Ginger loved spending time with Kayla & all her friends through the school years. She even helped us write letters to Kayla when she would go away on mission trips or camps & always insisted on going with us to pick Kayla up because she missed her so much. Her & Kayla often ran through the house racing each other or Gin would drag Kayla around the neighborhood on walks (she was a strong little mix of shar pei & dachshund!). About 6 years ago Kayla added a sister to our family for Ginger, a fluffy black bunny named Muffin. Muffin & Ginger grew to be friends, but like most little sisters Muffin often annoyed Ginger. As Gin grew older she mellowed out some and enjoyed naps in the sun on the porch & shorter walks. Ginger had a wonderful holiday season in 2018 & got to see lots of family, although she was pretty tired. Best of all she met Kayla’s new baby Athena & they got along great! In recent days Ginger let Kelly & Char know she was getting really tired & her little body could no longer work how it should. She passed away this afternoon peacefully at home, (Thank You Peaceful Passages!) on her favorite sofa surrounded by loving family as she gently took her last breath. Thank you God for choosing us to be her family & allowing us 15+ amazing years with this furry gift from heaven. Ginger taught us about truly unconditional love & it’s our hope to show that same unconditional love to others to honor Gingers memory for the rest of our lives. Beautiful - thank you for sharing. So very sorry for your loss. Ginger sounds like she was a wonderful dog. Thankful to your family for giving her a loving home and good life.